Over the last few months, I have had the privilege of working with Beko to bring you some brilliant prizes. This month is my final Beko giveaway and I am thrilled to be able to offer my readers the chance to win a Beko Cordless Handheld & Upright Vacuum Cleaner Deluxe VRT6221P. Vacuuming may not be the most Christmassy of topics, but winning prizes definitely is. If you are the lucky winner, this vacuum should be with you just in time to start that New Year’s resolution of vacuuming every day. (This is something I seem to promise every year but it seldom makes it past January!) The Beko Cordless Handheld and Upright Vacuum really had made cleaning so much easier in our house. 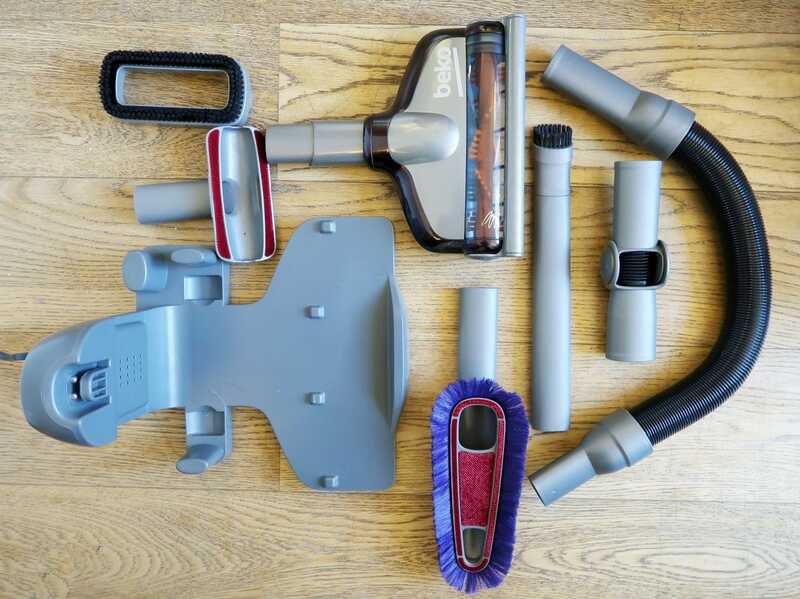 If you would like to know about the vacuum’s functions and usability in detail, you can check out Beko Cordless Handheld & Upright Vacuum Challenge. Can be used as either an upright or handheld vacuum. SelfDrive™ technology offers a powerful digital motor in the vacuum head, taking the strain out of vacuuming. 21.6v Li-ion rechargeable battery which delivers 25 mins operating time with 5 hour charge. 350W lightweight, digital brushless motor supports strong suction and increased reliability. 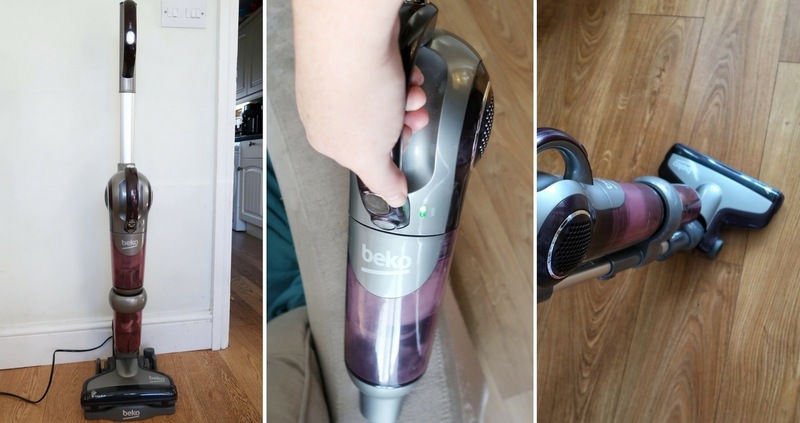 We have been really impressed with the Beko 2 in 1 vacuum and we definitely recommend it. With a RRP of £169.99, it is amazing value for money and can certainly compare with the more expensive brands on the market. To enter, simply choose from the entry options in the Rafflecopter below. Please note, entrants must be UK residents. Other terms and conditions apply and can be found in the Rafflecopter. Please note, this post is in collaboration with Beko. All words and opinions are my own. Due to disability I can no longer do the vaccuming but my carer finds it difficult to move our heavy Dyson. Having 3 hairy dogs means a lot of hair to get up ,so winning this would be perfect. I am getting near pension age and find my cylinder vacuum far too heavy to move around now. To win this would be a god-send, so fingers tightly crossed! great review would love a new hoover! I love that it can be used as either an upright or handheld vacuum. It really would make cleaning so much easier in my house. I’d actually love to gift it to my Nana, I know she’d love one! I would love to win because I have a Henry hoover that is very heavy. I had a hysterectomy 2 weeks ago and I can’t use Henry because of how heavy he is. I’m relying on family members to hoover for me right now so something lighter would help me out loads. My vaccum cleaner has a cord so is quite restrictive and it is old! Cordless would mean much easier to handle around our house. It would be extremely versatile and easy to manoeuvre round the house. Would desperately love a new hoover… I’m using my mum’s old one- We had it when I was a kid! It’s corded and weighs a tonne, I really struggle to get it up the stairs so something cordless and lightweight would be a godsend, it really would make such a difference. It would make life easier as I wouldn’t have to unplug to carry it upstairs. To make vacuuming the house, much, much easier. My daughter and I both have disabilities with make a ‘proper vac’ too big and heavy to manage properly so this would be brilliant. 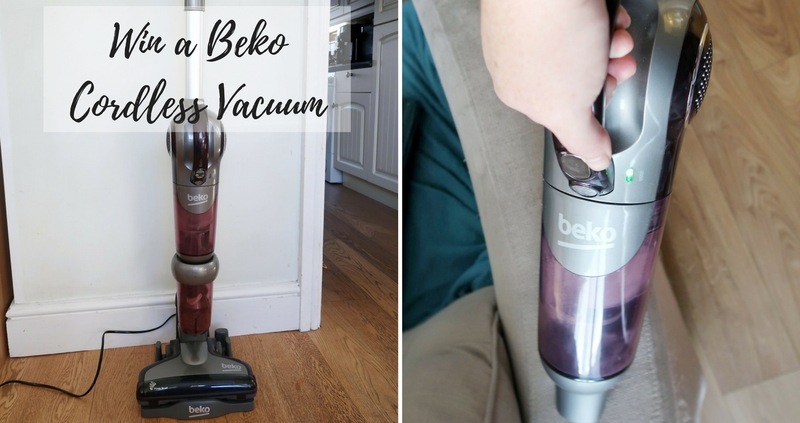 I would love to win the Beko Handheld & Cordless Vacuum cleaner because i have mobility problems & I struggle to push heavy hoovers this little beauty would make life so much better! My last cleaner gave up in a cloud of dust. TBH I was sympathetic towards it, coping with a busy family and 3 very hairy dogs is exhausting! I have two flights of stairs to clean and have to lug my vacuum cleaner up and down them and so this being cordless would be ideal. Looks far more manoeuvrable than my current beast, should make vacuuming less of a chore. I have a Labrador and so have to Hoover every day. My current vacuum is really heavy and difficult to get into smaller spaces. This vacuum looks like exactly what I need to make the daily hoovering easier. The one i have doesn’t work that great, so a new one would be fab. Would be lovely not to be restricted by a cord and to be able to do the stairs without having to struggle! To clean up after my 5 cats! to make it easier to hoover up all the kids mess! We would love a 2 in 1 as we are forever getting the big hoover out for a really small jobs, especially when my wife’s been knitting and/or sewing! would love one of these, make vacuuming a lot easier, save me having to drag my big heavy one around! I would love to win because I have 8 cats and they make a lot of mess with litter and cat fur. This 2-1 cordless vacuum cleaner would be very helpful as it would be quick to use for picking up stray litter and also for vacuuming the stairs. I am fed up with my old heavy vacuum, need a nice new one. It looks light and easy to manoeuvre. I need a lighter, reliable vac. 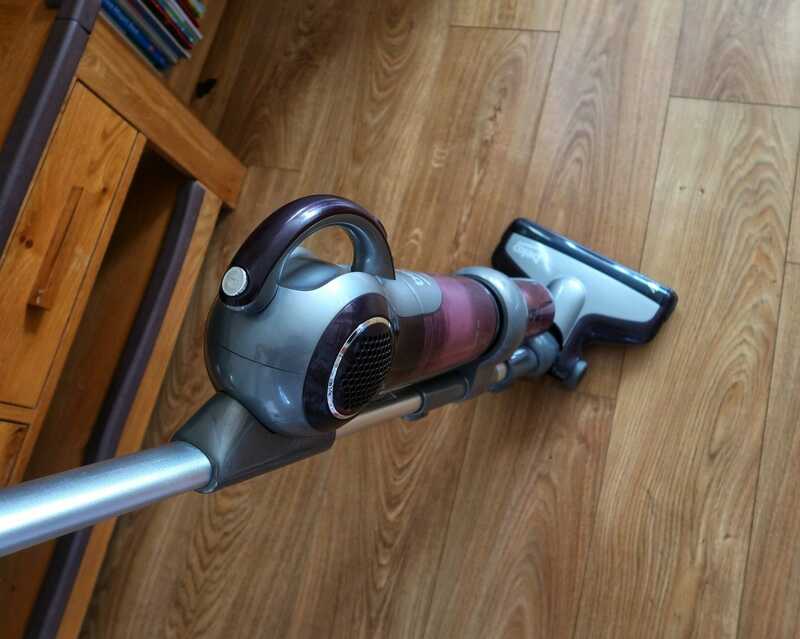 Have an old dyson which is heavy, ‘sticks’ to wooden floors and is a pain to get upstairs. I am a ‘fan’ of Beko, have one of their washing machines and a dishwasher, both have been reliable. I would like to win this as I have a Dyson that is quite heavy and need something lighter. It would be great to have a cordless vacuum cleaner as some of my rooms are large and I have to keep unplugging and replugging the plug into a different socket to reach the far end of the room! Our vacuum is too clunky & heavy for stairs so this would be handy! The reason why I would love this is that that it is cordless and that you have the option to use it as a handheld or an upright cleaner. I need a new hoover anyway, but the fact I can use this as a handheld would be perfect for clearing up the small bits of mess the pets makes would be very handy. would be very handy to have a cordless and handheld vacuum cleaner in one! I would like to win in so that I don’t have to buy one when I move into a shared house next year! This is so handy without the cord. Our hoover is on the blink and with pets and children to clean up after it’s a desperate situation, also this would be great with my health issues, would make it so much easier to vacuum. By the way I LOVE the Moana cake…..looks amazing, you make it look so easy in the video but making your own cakes can be very hard work. Great design! I love the biscuit sand! I’d love to win because my current vacuum cleaner has no power, its basically useless! I would love to win this as for my job I’m a cleaner so when I come home and have to do my own I don’t want it to be a chore! This would be a pleasure! At the moment I have an old Henry it is so heavy and cumbersome, this Beko cordless looks a delight to use, light, yet still doing the same job. Oh how I hate doing the stairs! We have a lot of furbaby fur that gets into the most hardest of places to reach and having a slim cordless hoover would help get to those places more easily. I get fed up of lugging my heavy vacuum cleaner upstairs and also hate having to unplug, then replug it in, when I move from room to room due to a lead that isn’t long enough. I would love a cordless just to be able to go wherever I want with out tangling the cord. Id love to win as we are Moving soon & this would be perfect! Love something light and compact to be able to hoover every corner in the house. A lighter vacuum cleaner will be great. After pet sitting for 3 years, we are moving in the next few weeks to a house, settling down, and I don’t have a vacuum cleaner!! This would be brilliant. My mum has one and they are brilliant to keep up with the cleaning & great to hoover the car out with too. Definitely worth having around the home with any kids around especially. It looks really handy, would like to see if they really do work well. I would love to win this because my vacuum cleaner is a bit knackered and I hate the thought of bringing it out! I’ve wanted a cord less Hoover for ages, purely because if I didn’t have to plug the Hoover in each room for it to reach I think I’d have more motivation to Hoover!! With 3 dogs, a cat and a partner that comes home covered in horse hair this would be ideal! i moved into a flat of my own a couple of months ago after a relationship break up. I’ve had to completely start again at the age of 41. I don’t have a hoover; just a dust-pan and brush. It’s laminate floors, but it just doesn’t ever feel clean to me, so winning this would be great cos I can’t afford to buy one for the foreseeable. I would love to win this as it sounds just perfect for zooming around the house with and my vacuum cleaner is ready to go to the vacuum heaven. Well with a large family this would be so much easier to use around the house. With 2 kids & 2 cats I NEED one! It would make hoovering much more easier and pleasurable without a cord getting in the way. I’d love this. It looks so much more lightweight than my beast which I fear will topple me down the steep stairs one day. I’d love to win this for my grandad. This year he got diagnosed with Parkinson’s and the strength in his arms has gone so this would be ideal for him to retain his independence when it comes to cleaning. This looks like a fab vacuum and I have two very messy children so this would be perfect! I would love this because it has everything you need from a vacuum cleaner, Its lightweight great for me with back trouble, I like it being cordless thats always a plus.And I like the attachments taking the strain out your back.& easier to get into those awkward places.Being digital seems like a added bonus.Like the handheld for doing over the sofa after kids have been. i need to win one because with gerbils, rats, a hairy dog and a son, the cleaning is driving me insane!! The fact that it is lightweight yet still powerful, having a digital motor and the fact that it can be used as a handheld or an upright cleaner – for all of these reasons, I would be delighted to win this vacuum cleaner. I would like to win one so I can go all over the house without having to keep stopping and finding another plug socket. Our current vacuum cleaner doesn’t quite reach the top step from downstairs so I have to heave it up the stairs and it is not light at all! Because my hoover I have currently is very old and heavy and I struggle with it . I hate hoovering but find it so much easier with a lightweight handheld. Hopefully it will encourage me to do it more! With 5 sons, ranging from 21 months to 21 years, the vac is never off – with a (final) baby due in June, this would be a godsend!! I have pets and am struggling with my old cleaner. This one looks like it would do the job very nicely. With a muddy farmer for a husband, 5 dogs and 2 toddlers – I could really really use a new vacuum cleaner. It would be so handy to get into difficult places, and much lighter than my current one. Because our vacuum is currently dying after all the DIY we’ve been doing and a cordless one definitely sounds like the way forward!! I would love to win because I am sick of either the dog or kids accidentally pulling the plug on my current vac while I am in the ‘zone’. It drives me mad plus the fact it would make cleaning the mess they leave in the car easier than the way I am currently doing it. The current way requires 2 extention leads and a dry day. I’m fed up of dragging my big hover up the stairs! i’d love to be able to hover the stairs without a cord stopping me (or a heavy hoover to hold). This looks really easy to use and I need to clean up quickly after my grandchildren! It would help to make my cleaning quicker and easier. I thought they were just another gadget I didn’t need until I used one at a friends house and wow they are so much easier to use! We have lots of beams in our cottage that need regular cobweb removal and rescue cats that leave fur everywhere which even ends up in the cobwebs on the beams! I’ve tried extendable feather dusters but they just leave the cobwebs smeared on the beams as they are rough due to being so old. My corded vacuum just doesn’t reach without being lifted up which isn’t easy to do and I end up in pain. With a cordless vacuum it would be so much easier and I would gladly hoover the cobwebs regularly rather than being nagged to do it and ending up with sore back and shoulders. I have cordless and a corded vacuums and both are on their way out. I definitely need both, but don’t have the room, energy or budget for two separate cleaners. This would be amazing especially given your positive review. I’d like to win this because mine broke before Christmas and I’m using a borrowed one from my parents which is useless! We could really use a lighter vacuum cleaner for the stairs. Lightweight for the stairs and easy to get out and use for small messes! It would be so much easier to use rather than trying to find a convenient plug when vacuuming. I would like to win because our current vacuum cleaner is on the way out and getting all the wire out and dragging it round the house is a bit of a bind! I would love to win because stair cleaning would be so much easier. This would help me to keep my house, in particular my stairs, much cleaner. We’ve always wanted a cordless vacuum but haven’t been able to afford it! Yes please, would love to win, thank you for a great New Year giveaway Someonesmum, my old hoover is so heavy, and I definitely need a light cordless one to help me in my twilight years, the easier the better!!!! Good luck to everyone and have a happy and healthy new year, which am sure we all wish for! No tangling power cords would be great for my rooms and garage. I live in an old, dusty farmhouse with two sets of stairs that do not connect on the first floor. One of these would be perfect to keep in the “other side” of the house. Because my vacuum is 11 years old, and doesn’t pick up well any more. I would love to use the handheld vacuum and pretend I’m Dr Spengler on the Ghostbusters film! I’ve got a very hairy dog as well as a messy child that this would, hopefully, help with. I have 2 dogs that shed so much fur, with dodgy joints I find corded vacs a nightmare to use so can only use mine sparingly and have to sweep the floors in between. This cordless vac would make keeping my house cleaner so much easier. I would love to win for my husbands grandma. Although she is 84 she is very independent but struggles at times with her housework, I think this would help a lot. I’d love to win this for my Mum who has a vacumn currently that sounds like I’m standing behind a jet plane about to take off. Its lightweight, efficiently cleans up cat hair and I am always tripping over the cord or finding it too short. This vacuum Sounds to good to be true!! My latest cheap vacuum has given up for the new year. I would love to win this for my parents, as they have a HUGE old Hoover, they both have heart conditions and really struggle to cart it around the house, especially up the stairs. I’d love to win because its cordless and lightweight which is everything I need in a vacuum cleaner. My current one is old and very heavy and I have to wait for someone to take it upstairs for me before I can use it. It would be more flexible to use especially on the stairs. This would make doing the stairs so much easier! Would love this to tidy up after my 3 year old! My vacuum has just broken, it would be a miracle to get a replacement! My dyson broke on Christmas Eve so this would be perfect for the new year. Our vacuum doesn’t do the job properly and is old. This would be fantastic. I would love to win this Beko cordless vacuum cleaner because it would be great to have no cord to trip over. I’ve always had a vacuum cleaner with a bag that needs replacing every few months, so having a bagless one would thrust me into the 21st century! I have a bad back, This would be much safer to handle. I’ve used my health problems as an excuse to be a filthy minger for too long – now there are tools to help me, I really should start doing some cleaning again!! I would love a cordless hoover because ours is ancient, heavy and useless. With a 5 year old crumb monster I am always hoovering and this would make life so much easier.